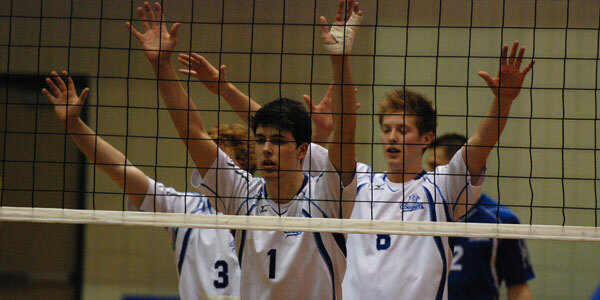 New recruit Trent Mounter and his Mount Royal Cougar volleyball team are knee deep in the pre-season getting set for conference play in three weeks time. Last season’s ACAC men’s volleyball player of the year, was one of many highlight recruits who will sport the Cougars logo on their chest during the hardened courts season for the first time. Mounter recalls his journey to MRU which traces back to his native Perth, Australia. Like many kids growing up in Australia, he played Aussie Rules for most of his youth. “I played for about 10 years before making the choice to pursue volleyball which is the sport I ultimately fell in love with,” he says. It was in middle school where he made the decision to pursue volleyball as his main sport, attending a volleyball specific school. “We got the chance to tour Europe and Asia and that’s where I decided to get as much film as I can and find a school to play for in uni,” Mounter says. It was in Edmonton where Mounter got to experience his first ACAC action attending NAIT and suiting up for the Ooks. He heard that Alberta was an Aussie-filled place which made the move to Canada seamless. He originally enrolled in the personal fitness program for a year before a shift in plans lead him to move down to Calgary and join the SAIT Trojans. Mounter moved to Calgary after his experiment year in Edmonton with the hopes of starting with a clean slate. He changed his program and began pursuing a business degree in the hopes of working in human resources. He goes on to explain that he had other offers from other ACAC schools, but Calgary was the best choice for him out of the rest. During his two years at SAIT was where the Aussie began to fill in his golden resume. Mounter was named to the All-Conference team in his first season with SAIT and ended his career in legendary status as a Trojan last year. Last year, he captained his Trojan’s to one of their most historic seasons ever at 20-4 and lead them to the ACAC championship. He was also named MVP of the playoffs and finished his splash of success by scooping up the ACAC men’s volleyball player of the year, a statistically dominated season to say the least. “It wasn’t a big move or anything like that,” Mounter says on the transfer from SAIT to MRU. Coming to Mount Royal, he is only looking to stack on his impressive collegiate volleyball resume and take his game to the next level. “It’s a quicker game but it’s been a good learning curve getting back to [it]. Back home I was more used to the quicker pace and higher skill. ACAC was obviously at a high level but not everyone was there, whereas in U SPORTS everyone is on another step,” he says. “The facilities are top class to go along with the team and their staff,” he says. After a rough regular season last year, where the Cougars were a few spots shy of a playoff spot, Mounter is looking to bring in his experience and fill some of the leadership voids the growing program has. “I hold myself to a standard — doesn’t matter if these guys have been playing at this level more than I have. I just want to contribute as much as I can and my aim is to get the best out of everyone,” says Mounter. “Part of the team last year was missing leadership. I might not be ‘the guy’ but I definitely will be in the group of guys,” he says. The goals for the season? Mounter has his eyes set high for his first season in an MRU shirt. “Definitely the national finals, top eight [to make conference playoffs] for sure would be the lowest goal and then final four after that,” Mounter says. MRU are currently competing in a handful of tournaments and exhibition play where so far, they are seeing success but the live bullets fly on the weekend of Oct 19., where the Cougars open their Canada West season against Manitoba at home.